She Makes War | I’m in a Sheeran/Gallagher sandwich and I want to get out! Blog : I’m in a Sheeran/Gallagher sandwich and I want to get out! * Here’s how you can help! * Stock is running low! At the time of writing there are 64 copies of the pink splatter vinyl, 43 cassettes and 13 signed CDs remaining. Go go go! It’s been a surreal couple of days. On Monday night I played an in-store gig at Rough Trade in Bristol, a really fun, sweaty, joyful and happily rammed show with my band. I rarely drink at gigs, but decided to celebrate with a few beers and some late night tacos with my husband. Delicious! No commiserating was necessary – in this new bizarro world we’d suddenly entered, my plucky little independent album “Brace For Impact” was the meat in a rather strange Ed Sheeran / Oasis sandwich, my record label My Big Sister Recordings nesting familialy next to Big Brother. We were stunned. I know musicians are supposed to obfuscate or lie by omission, pretend either to be minor celebrities or never mention the big machinery operating behind them, but if you know me at all you’ll know I’m just not that sort of artist. My album team consists of me, my husband Tim, brilliant distributors SRD, regional and national press guys Sonic and Wilful, plus Ash and Connor, two very clever Facebook ads chaps. That’s it. No manager, no label, no agent, no radio plugger – and to be honest, not for want of trying over the last 8 years, of building a dedicated audience by doing, of sending music to people, of demonstrating time and again there’s a market for the music I make. The music biz is full of gatekeepers (necessarily, otherwise they’d drown in music) and people who need to impress their bosses with quick wins, all the great managers are busy and dedicated to their existing artists and not being able to find champions doesn’t mean your art is no good. Given all this, the sight of my name sandwiched between Messrs Sheehan and Gallagher provoked a few overwhelmed tears and quite a lot of hysterical laughter (sorry neighbours! ), but then it was time to set to work, time to rally the troops. 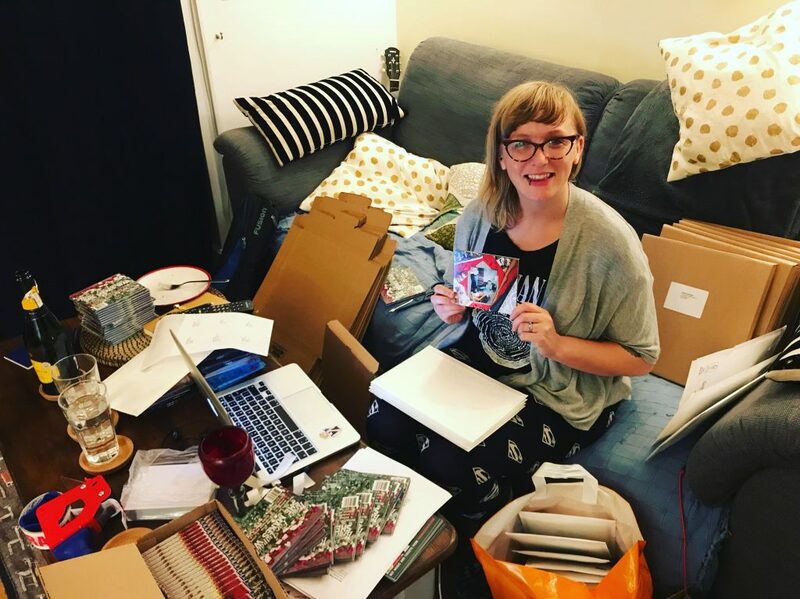 First thing Tuesday morning before work I sent a mailout to 8000 people on my mailing list imploring them to help – if they were ever considering buying any music from me, now was the time, I said. I followed up today with a last plea to buy, share and endlessly stream, and am so thankful to everyone who has joined my mission to send the album of which I’m so proud hurtling into the big wide world at the highest possible velocity. Each and every one of you has done something very special in the name of music lovers the world over who don’t need to be dictated to by a shiny ad or subjected to relentless playlisting to decide you like something and you want it to be part of the fabric of your life. It’s a great honour to be part of that, you know. The Top 40 is the place I found most of the bands and artists who had the biggest impact on the shaping of my musical brain (The Pixies, Nirvana, Blur, Smashing Pumpkins, QOTSA, Elastica, Suede, Sleeper, and on and on), so OF COURSE I would love “Brace For Impact” to crash on in there tomorrow and perplex the people who keep an eye on such things. I’d love to sell squillions of copies so I can fund the recording and release of my next album, play to more great people at shows, pay my band well and feel like there aren’t *quite* so many barriers to my plans. That would be ace! But thankfully my happiness doesn’t ride on an arbitrary number in a competition I didn’t really even plan to enter. Whatever happens tomorrow I’m delighted to have “Brace For Impact” in your ears, I’m excited to start my full band album launch tour next week and looking forward to commencing the writing of the next She Makes War album before the year is out. It’s the journey not the destination, baby, and what an amazing journey it is! Thanks so much for being part of it. Now, please go and listen to “Brace For Impact” in whatever way you wish! My new album “Brace For Impact” is available here and I have a back catalogue to explore here. Why not come to a gig some time! Laura, it’s great news whatever the placing. Sure your music means more to fans and followers than the ‘consumers’ buying into Liam and Ed. It is true all first musical loves are found through the ‘mainstream’ exposure. But having been there and done that, I’ve no desire to buy my CDs in Tesco. And with the dwindling fall of independents (and second hand record shops TBF) , the internet has taken that’s place to look, or just simply stumble upon stuff. Its where I found you and your work. (Think it was a retweet or something praising you, via Thea Gilmore years ago), and now have all your albums and even a t-shirt ! The internet is an Aladdin’s cave…well more of an over grown jungle of music. But I for one am glad I’ve managed to weed out stuff that’s let me contribute as a fan and follow the journey too. However big or small. Not even sure what the point of my rambling is, but it’s been great evolution. I love hearing how people stumble across my stuff, thanks for taking a chance! Brace for Impact is just BRILLIANT ! Thank you Peter! After a while with the album, which are your favourite songs? Every listen i hear something new, it has depth and it grows as an album. Mainstream music today has an over processed, emotionless and soul less feel to it.. imo. (Saying that, it was the tanya donelly link that brought me to your music. So mainstream does have its benefits. Yes, there are only so many notes to play with, but you can hear the sweat, the tears, the emotions in the songs that are thoughout and have been developed and nurtured to create an album. The mainstream industry unfortunately wants profit over substance. Glad your album is placed and is being recognised. Shake up mr sheeran and mr gallagher and hopefully they’ll move out of your way and let you through.. Thanks so much for your support, and for following that link 🙂 Tanya is wonderful. Good luck tomorrow and see you in Oxford. Can wait to get to the real world of off iOS that is blocking musical enjoyment! I would say that is amazing, but only because you are an independent artist. The album certainly deserves a higher chart ranking, and I hope it gets it! I’m made up for you! It really is a great album you’ve made there and fingers crossed it goes higher! See you at the Thekla. OK – cutting it a bit fine, but just ordered the pink splatteriness. Did you say you were going to sign it? Or should I bring it with me to Norwich? Anyway – love your success so far. Long live the independent movers in music! First of all I am loving the new album. Had it on all day repeat streaming on Wednesday at work! I think #47 Is a great achievement but I’m hoping you can finish the full week several places higher. I also hope you sell gazillions of albums over the next 50 yrs because your music deserves to be heard. Ok and maybe also because you’re just such a lovely person. Having said that I would miss helping out at the funding stage. It feels like I am helping more than if I just buy the CD from your website or elsewhere. Of course there’s also the wonderful perks which we can treasure for many years. Whatever happens over the next few years I know I will still be buying your albums and I am eternally grateful to the artist who employed you to play guitar at her pledgers show back in 2014. Yes – thank you Janet! I hear what you’re saying about the funding stage, Andre, you’ve all been a very supportive “record label” over the years so I wouldn’t want to skip past that part. I’ll figure out a way to keep everyone included for sure. Pingback: She Makes War | Look what you did! She Makes the Charts! Hi Laura – congratulations on the chart position – but more importantly on producing a great album. I really love it. Thanks for the ongoing support Colin, I really appreciate it!